To register, input your email address in the box above. You will receive a confirmation email to complete the registration. Your address will not be shared and you will not receive messages from other organizations. The internationally acclaimed artist Toshiko Takaezu died March 9th in Hawaii attended by three generations of her loving family. As the art community around the world mourns and struggles to plan appropriate memorial events, Bloomsburg University should reflect on the 41 years that she generously contributed to the artistic, academic and human excellence on campus. The relationship began in 1958 when Tosh, professor of ceramics at Princeton University, met Percival R. " Bob " Roberts, former chairperson of the Art Department, at Haystack Mountain School. For me it was in 1966 when some mutual friends took me and two other recent undergraduates to meet Tosh at her studio in Clinton, New Jersey. We were all given the hospitality of tea and cakes. The tea was served in her own tea bowls, an exciting event for all of us to say the least. The next night she came to the statewide show we were in to judge and give awards. She called me out to her car and proceeded to give me the six bowls indicating who drank out of each one. It was her gift to us. Oh my gosh. I would learn in the years to come that generosity was a mainstay of her personality. As a warm friendship continued, whatever Tosh saw or felt about campus must have been positive. I think it was the students. In 1971 she gave our university a painting by Sawada, a designated treasure of Japan, which is displayed in the lobby of Mitrani Hall. I believe it's one of three in the United States, the others being at the Cleveland Art Institute and Princeton University. In 1979 she agreed to have an exhibition on campus and at its conclusion gave two of her works for the permanent collection. Upon the untimely death of Dr. Roberts in in the fall of 1984, the Art Department requested the University Council of Trustees to designate an area near Bakeless Center to be the P. R. Roberts lll Sculpture Garden. In its June 1985 meeting, the Council moved to establish the sculpture garden. For the next year, a fund raising campaign was conducted to develop support for the acquisition of sculpture. After a year of discussions and contemplation, we realized we couldn't see the forest for the trees and overlooked the obvious. In recent years Tosh began working in bronze besides her traditional stoneware ceramics. And so it seemed most important and appropriate that this new area begin with a piece from Bob's long time friend and colleague. As Tosh said in a newspaper article "I liked Bob a lot and for me it's an honor to make this memorial bell." 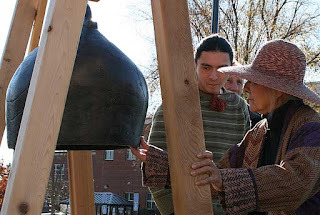 It took a year to produce the bell as we worked in three phases -- Tosh making the image in water based clay-the mold making and wax model investment-and the burn out, casting and finishing of the bronze. We ( three senior art majors did most the work including the pouring) conducted open workshops during all three phases so people had the opportunity to interact with the artist and learn about the process. This might have been the first commission of one of her bronze pieces in North America. The dedication of the bell, along with the three Micheal Price bronze figures Philip and Murial Berman gave us was in early fall of 1989. The sculpture garden was begun. Many times the message would arrive "Oh you should bring your students down to see the new works and we'll have lunch." "And we'll have lunch meant" that all twelve of us were going to eat one of Tosh's specially prepared meals. During these visits she asked students what they were doing now and next year and the year after that. And in all the years that followed, she remembered names, ideas and schools to be attended and always asked for updates on everyone's progress, including my own. That was the Dean of Quality expecting excellence. One time during the conversations, the students were talking about the Student Art Association's upcoming art auction to benefit the Childrens Museum, Tosh got up went to the studio and came back a piece she wanted to give for the auction (the auction by the way was a success earning $2500 for the museum). The support was always there without hesitation or reservation. In the spring of 1995, she had an exhibition in Kyoto, Shiho Kanzaki, a ceramic artist living and working in Shigaraki, but with family ties in Bloomsburg (he built an anagama kiln here in 1993) was advised to go and introduce himself to her. He did and the two became friends. At about the same, Peter Volkous was at the Ceramic Park in Shigaraki doing a workshop, the advice was the same, and the result the same. By mid summer word came from Japan that we would be doing a 10 day firing in September including the works of Peter, Tosh and Shiho. Oh my gosh again. Tosh came to the firing and once again embellished the students perspective of life and art. The opening was a great event, lasting into the evening. The interactions between the people and the art afforded all in attendance a learning opportunity rarely experienced anywhere. Over the years we interacted in person once or twice a year, sharing food, thought, work schedules and of course the latest on student progress. It's maybe not so much compared to others, but I think we both felt it's ok knowing you're working, it makes me feel good knowing you're there. She came to campus in 07' to review my anagama work. The review went well and there was a lot of insight and humor shared with faculty and students. The meeting moved out home for a meal and more discussion with the usual ten or so students invited to complete the caravan. 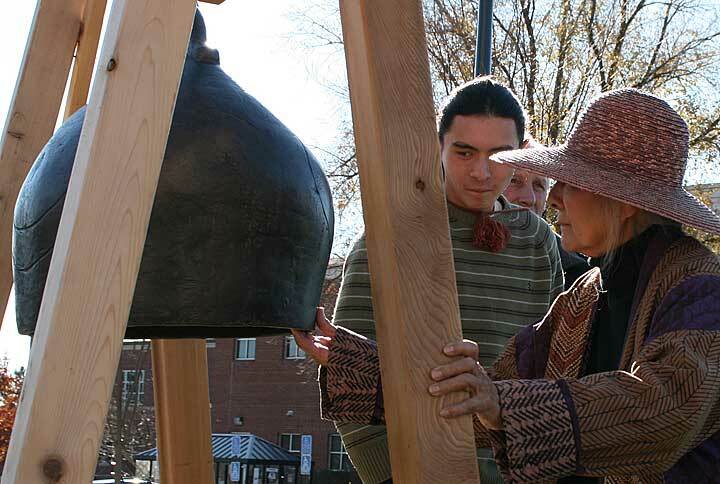 She returned to campus in the fall of 08' for a reception in her honor and to review the new location of her bell. She had just added 19 pieces to the permanent collection of the University. The teaching was still going strong and we all benefited. It was another great time although I felt a level of guilt realizing the extreme physical effort she was making on our behalf. I knew better than to question the mind over matter issue as the decision had been made weeks ago. It was just a splendidly purple day, as special as it could have been, ending out home eating and talking some more with students. When referring to life, art and the garden she used the question "who knows? " as an acceptance of the abstract complexities of it all. I always felt like saying..."You do!" And so the woman of great intelligence, beauty and humor is gone but the intense light of her art and teaching remains throughout the world. Thank you, thank you, thank you! I have been asking for rememberences of this fine artist on line and HERE IT IS! Thanks! I really wish I could have been nearer to her! 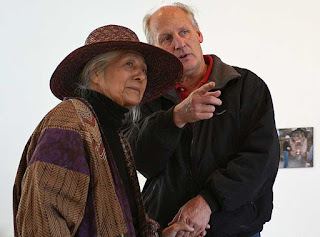 Toshiko mentored my father when I was young. She always seemed magical to me back then, but even more so now. This memorial certainly reflects her essence. Professor Beamer introduced me to Toshiko when we took a trip to her studio in New Jersey. I had admired her work since I was an undergrad student and had the opportunity to fire some of her works in Professor Beamer's anagama kiln. I can still remember the day when we opened the kiln. Lots of anxiety carrying her work, lots of warnings about dropping them and lots of talk about their price tag. I remember one piece and can still see it some 10 + years later. There was something special about this piece, to this day I still cannot put my finger on it. It is just that "thing" that speaks to us internally. I remember holding it, staring at it, and I remember exactly how that work of art made me feel. Professor Beamer took me to her studio for an opening and introduced me to her. I immediately asked if I could return on a day to look at all her work. (her home was full of it) she graciously said yes and asked that I call when I wanted to come. The visit was one of the most special days of my life. We had tea, we had a snack, we sat and we talked, she was very interested in my work, what I was doing, why and what I intended to do. Her old colleague stopped by and I had the chance to hear them reminisce about the "old days" in NYC in the 1950's, the Abstract Expressionists and the "good times". Priceless. I purchased one of Toshiko's pieces that day, and she gave me another, as companion piece I believe she called it. It was a lovely day with a gracious, kind, intelligent artist, whose company that day made me a better artist and more human. Thanks Professor Beamer, and thank you Toshiko. A journal of photo assignments at Bloomsburg University. Updated several times a month.